You’ve heard of the Baby Mozart DVDs. Perhaps you even played them for your son or daughter when they were first-born. This collection of movies, pairing puppet shows with the works of composer Wolfgang Amadeus Mozart, is used by parents all over the world in a bid to make their children smarter. Though it sounds optimistic at best, there may have been a point to sitting your child in front of the TV. It’s because of the Mozart Effect, although any classical composer’s works will have the same effect. Studies have shown children perform better at physical and mental tasks after simply listening to classical music. Now can you imagine the improvements they’d make if they actually played music? Since you want to provide your children with every single trick, tool, and opportunity to succeed in life, there’s no harm in following that train of thought. In fact, emerging studies completed by pediatricians, psychologists, and neuroscientists suggest that you and your children only stand to gain by adding music to your lives. Musical education provides demonstrable advantages to anyone willing to commit to their instrument. Whether your child is 6 or 16, there are music lessons for all skill levels available to help them tap into their full potential. It all has to do with how the brain functions whenever an individual reads and performs music. Neurological pathways in the left hemisphere light up anytime you play an instrument, strengthening the connections you’ve formed over the course of your life. When this occurs in the developing mind, when pathways are still in the process of being created, the connections are made even stronger. For anyone who remembers their own elementary school lessons, the left hemisphere is where the abilities to process language, mathematics, and spatial awareness are located. By learning to read and play the notes on the page, your children are stimulating these parts of their brain. This process is like weight training your biceps. After following an exercise regime, you’ll be able to lift more. Eventually, with deliberate practice, your children’s aptitude for language and math will improve, resulting in better a performance in their academic studies. Musical education also has a profound effect on their abilities outside of the classroom. With regular music lessons, children are able to engage in divergent thinking with more success than other children their age who have no musical training. Divergent thinking, or the ability to think creatively and critically when solving problems, will help your children resolve complicated issues in their life at any age. Regular practice also tests your child’s patience. Learning an instrument doesn’t come naturally to most. It requires a lot of hard work and determination to master, but the payoff is worth it. Not only will they have the ability to play their chosen instrument with ease, but they’ll learn that great things come through perseverance. In comparison, the Mozart Effect of simply listening to music isn’t enough. 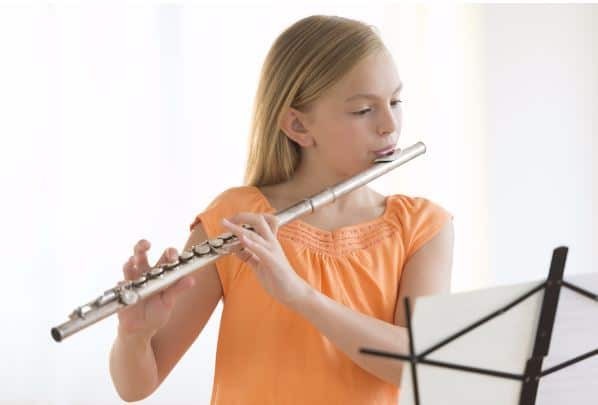 Let your child capitalize on the advantages musical education will provide them. It doesn’t matter if it’s guitar lessons or piano lessons as long as you find a qualified musical instructor who can teach your kid the rudiments of music. Once they begin exploring their instrument for themselves, they’ll stand to do better in all they put their mind to. As a parent, that’s all you could ask for.